It’s only been a few months since Dark Souls 2 landed and already we’ve got another Souls-esque game to get excited about. Bloodborne comes from the creator of the Souls series himself, Hidetaka Miyazaki, developed in conjunction with Sony Japan. It is very much a Souls game, borrowing many of its design sensibilities, but only in a spiritual successor sense. For as much as it looks and feels like Dark Souls, Bloodborne also clearly has an identity of its own. The demo I sat in on was completely hands-off, but still very informative. It began at an intersection of a large, gothic, Victorian-era style city. The moon hung overhead, bathing the eerie streets in its comforting glow. Carriages lay strewn about, some topples over while others just stood there abandoned. Signs of a once prosperous city lay everywhere, making it feel all the more sinister and unnerving. What could have possibly occurred here to have put such a massive metropolis in this horrid state? None of us in the small theater get much time to dwell on that, as the presenter begins to move forward. A rather large looking man leaps out from behind one of the carriages and attacks. The presenter’s caught off guard and takes a nasty blow, the character’s coat now stained with blood. He readies his strange retractable blade and strikes back, geysers of blood spewing from the attacker, coating the streets in red. The enemy goes down easily, some sort of subtle light being absorbed by the character (souls, perhaps?). The presenter stops to take a moment to explain the mechanics of the weapon the character wields. It’s a large, jagged blade attached to a worn looking wooden handle. With the press of a button, the blade can be retracted or extended; the former is faster but only works at close range, while the latter is slower but has more reach and deals more damage. The blade’s function can be adjusted on the fly mid-combo, a technique that seems like it’ll be key to survival. In the character’s left hand was what looked to be a blunderbuss shotgun. Its range is limited and firing it looks to leave the character open for a good second or two, its use primarily to stun foes and for crowd control than to deal any real damage. They didn’t say whether it would require ammo to use or if it would be unlimited. 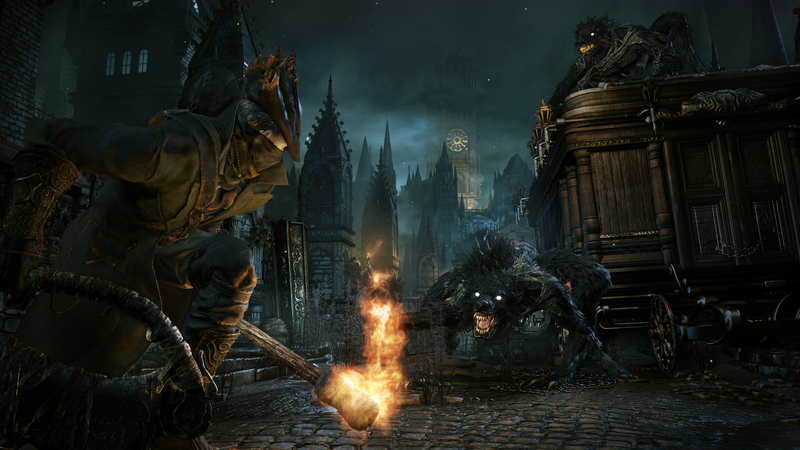 Combat in Bloodborne is meant to be more active than that of Dark Souls. Instead of sitting back, shield raised, waiting for a moment to strike or finding a weakness to exploit, Bloodborne demands you take a more aggressive stance. It’s why your character wields a gun in addition to a blade, why he doesn’t carry a shield or any other defensive tools. I don’t even know if guarding is even possible – the presenter never tried to do so, always resorting to back-steps and dodge rolls instead. Failing to go on the offensive will apparently lead to you being overwhelmed by enemy numbers, which definitely seemed possible even with the small number of foes encountered in the demo. The presenter moved through a couple of alleyways until he arrived at a porch overlooking a mob of enemies moving through the streets. Behind them was a werewolf burning at stake. Rather than rush in and take the mob head on, they decided to wait and pass by unseen. 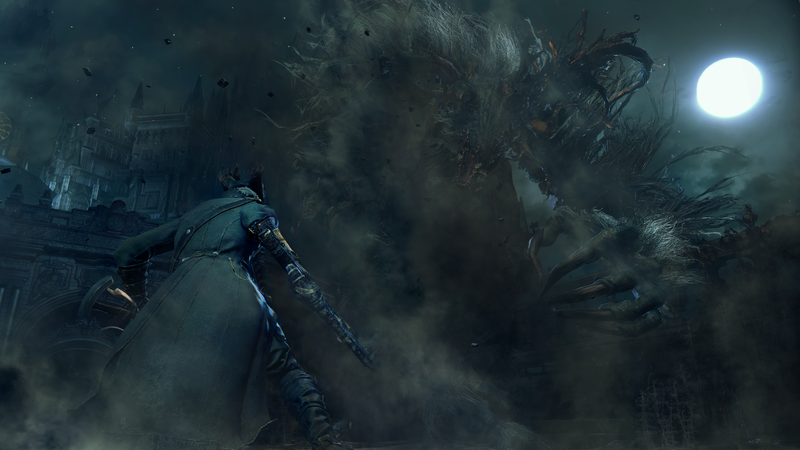 The scene was indicative of how enemies behave in Bloodborne. No longer will they remain glued to a single spot, waiting for your arrival. Instead, they’ll move about of their own free will, certain events in the environment – say, a bell ringing – causing them to migrate to different areas. It also seemed to suggest there are multiple paths to take. The demo stuck to side-roads and alleys, but there were plenty more paths to explore. That road the aforementioned mob took, for instance; the presenter avoided it since taking on six or seven enemies at once would be foolish, but perhaps there’s some grand reward to be gained for doing so? Maybe it leads to a different area entirely. He continued down a different path, encountering some more resistance along the way. The character’s coat was looking grungy now, bloodstains becoming steadily more visible with each kill. Eventually he arrived at a small crossing just outside a massive gate. Pounding was coming from the other side, two foes standing before it. He quickly slays them and moves around the gate to investigate the noise. A large, hunched over figure in a cloak stands in the distance, continuing to pound the gate. Best to leave it be for now. Not long after, a pack of werewolves attack. Unlike the enemies before, they’re far more ruthless and swift, rarely letting up on their assault. This encounter was interesting because an NPC was under attack by these things as well and requested assistance. By doing so, he could end up repaying the favor later. But by ignoring him, you won’t have to worry about the enemies since they won’t shift focus toward you until you attack. The presenter decided to leave him. He moved down the road further until he crossed under an archway. A massive werewolf-like creature jumps down, its matted fur and exposed ribcage giving it quite the frightening appearance. Time for a boss battle. Unfortunately, this is where the demo ended. They attempted to fight it for a minute, but quickly reset the demo before the battle really got underway. Though brief the demo may have been, it was more than enough to get me excited. A new Souls-inspired game is enough to get me interested, but a new one from the very creator of the series? Sign me up. Spring 2015 can’t get here soon enough.